Logitech reveals two new additions to the Squeezebox family | What Hi-Fi? First in line is the Squeezebox Radio. It's an all-in-one solution that simply plugs and plays, connecting straight to your Wi-Fi connection in order to get up and running. Internet radio, streaming music from iTunes and services such as Napster and Last.fm are at your disposal, and integrated speakers mean there's no need for extra kit. A 2.4in colour looks pretty smart and allows you to connect rather cleverly to Facebook in order to share tracks with your friends and laugh at their awful taste in music. Out now, the Squeezebox Radio is yours for just £159. Second in line is the Squeezebox Touch (pictured above). This is aimed at more discerning ears and connects to your existing active speakers or hi-fi system. You'll find a 24/96 kHz DAC, advanced audio rendering technology, digital coaxial and digital optical audio outputs, and standard stereo outputs. The Touch is compatible with MP3, FLAC, WAV, AIFF, WMA, Ogg Vorbis, AAC and Apple Lossless files streaming music, Internet radio and content via the USB and SD card slots. A 4.3in screen sets the system off and again gives you access to the Facebook application. 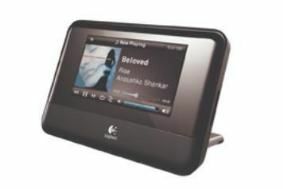 As with the Squeezebox Radio, it's compatible with all other products in Logitech's range should you wish to expand to a multiroom system. The Squeezebox Touch will be out in November at a price of £259, and we'll be bringing you a review very soon.